Baseball Hall of Famer Rod Carew opens up about his near-death experience from a heart attack, the life he's living now and his hopes for the future. SAN DIEGO — Playing alone at Cresta Verde Golf Course in Corona, Calif. on the sunny Sunday of Sept. 20, Rod Carew hit his drive off the first tee precisely where he drove so many of his 3,053 hits with the Minnesota Twins and California Angels: “Right down the middle,” he says. Carew is sitting in an easy chair. Minx, a black Bombay cat, is perched above his right shoulder. Both exude a quiet grace—they look equally feline in repose—and there’s a brief silence in the house as Carew considers that a kind of mechanical heart has been implanted in his chest, alongside his damaged one. After a moment, the most elegant hitter of his generation puts his face in his hands and sobs. As a child, Carew was routinely beaten by his father. At 50, he lost his 18-year-old daughter, Michelle, to leukemia while she waited on a bone-marrow transplant list. His first marriage, to Marilynn Levy—the couple have two daughters in addition to Michelle—didn’t survive that tragedy. It was only between these agonies, while bedeviled by a fear of flying, that Carew was the man you thought you knew: a batter of unsurpassed calm and beauty. And so Carew now has something called a Left Ventricular Assist Device (LVAD) pumping blood on his behalf. It was installed, in a six-hour open-heart surgery, at Scripps La Jolla hospital by Dr. Dan Meyer and Dr. Sam Baradarian—“The Barbarian,” as Carew’s 26-year-old son, Devon, says with enormous affection for all the medical professionals who saved his dad's life. “Ten years ago,” Rhonda says, “Rod would have been dead.” But he survived the arduous, open-heart implantation of the LVAD, which typically acts as a bridge until a patient can receive a heart transplant. He’s off to a promising start. On Nov. 5, Carew became the fastest patient ever released from LVAD rehab at Scripps Memorial Hospital Encinitas. He unzips his FBI SWAT team vest to show off his new lifeline, which consists of a small computer controller worn on his waistband and two battery packs tucked inside the vest. He lifts his shirt to reveal tubes running from the battery pack to the controller and from the controller through his abdomen into his chest, where the LVAD pumps blood to his own heart—from his left ventricle into his aorta. As for the human members of his family, their love moves Carew daily to tears. “She’s everything,” he whispers when Rhonda leaves the room. “The same place you got it with Michelle,” Pace says. “We were coming through security at [Los Angeles International Airport],” Devon says, “and the guy there asked Dad if he knew what a ‘Rod Carew’ was on Urban Dictionary.” (It’s a vulgarism that involves going from first base to third base without touching second.) Rod shakes his head in mock dismay upon hearing this, like a put-upon dad in a sitcom, which he often appears to be. The Carews have embraced these moments of comedy in the last two months. When the LVAD was installed, doctors told Carew he could do everything with it but swim or arc weld. Rod, whose indifference toward swimming is exceeded only by his apathy for arc-welding, shook his head in faux despair. “No arc welding?” he says now with a sigh. While Carew slowly climbs the stairs as part of his therapy—the handrail is on the left—Vuong asks him which hand he is. Carew answers that he’s righthanded, never letting on that there are two conspicuous exceptions: He swung a baseball bat lefthanded (winning seven American League batting titles, his dominant right eye closer to the pitcher) and he swings a golf club lefthanded (making seven holes-in-one as a 12 handicap). Vuong confesses that he’s not a baseball fan and had to Google the name “Willie Mays” when a colleague excitedly showed him the Say-Hey Kid’s autograph. On hearing this, Carew gazes into the distance with a look of deep amusement. Then he tells a story. Not long before his heart attack, he was visiting the batting cages near his house in Orange County. He does this from time to time, offering gentle pointers, like Leonardo da Vinci dropping in on a grade-school art class. When he saw a seven-year-old facing 70-mph pitches from 60 feet away and suggested to the boy’s father that he reduce both the speed and the distance of the pitches for his son, the father suggested that Carew mind his own beeswax. Just then an older kid walked by and said: “That’s Rod Carew!” Life seldom offers such tidy satisfaction. “The guy apologized up and down,” says Carew, laughing. After that, he visited children in hospitals whenever he could. In 1977, he won the Roberto Clemente Award as baseball’s exemplar of community service. He has seven silver bats and the 1977 AL Most Valuable Player award, but the Clemente award is the one he shows visitors. “I’m supposed to be this big guy,” he says. “But I cry a lot.” When the Twins traded him to the Angels in 1978, he cried. It is no wonder, then, that the handful of friends in baseball who know of his plight have comforted him in turn. Former players like Don Baylor, Johnny Bench, Doug DeCinces and Chili Davis have visited or called. So have Twins president Dave St. Peter and Angels president John Carpino. Carew’s advisory contracts with both teams expired 10 days after his heart attack, and both teams renewed him for 2016. Jeff Idelson, president of the Baseball Hall of Fame, has been poised to notify Carew’s fraternity brothers in Cooperstown whenever the first-ballot Hall-of-Famer was ready to go public. And so he has had the profound decency to reveal himself at his most vulnerable. He will help the American Heart Association do the same kind of advocacy he practiced for those leukemia patients who needed bone-marrow transplants when Michelle died in 1996. Their story increased registrants to the National Bone Marrow Registry, saving untold lives. Indeed, the night before his heart attack, Carew participated in a fund-raising walk for leukemia research at the ballpark where he was once an Angel and remains a kind of angel. “You are here for a reason,” Rhonda tells Rod, repeatedly. “The Lord wasn’t ready for you yet. He kept you here for a reason.” Whatever that reason is—whatever the meaning of his life—baseball is beginning to look like only a small part of it. 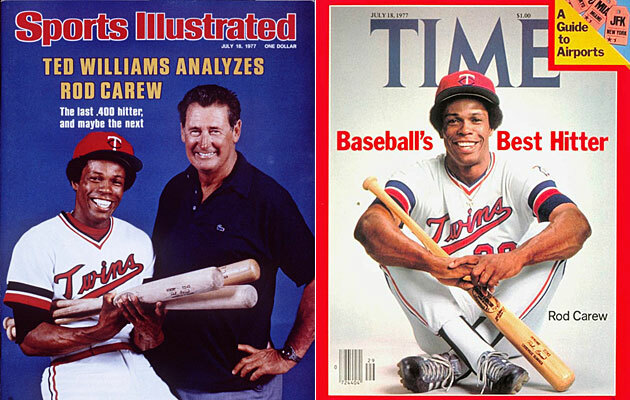 At the peak of his powers in the summer of 1977, a year in which he hit .388 for the Twins and made the covers of Time and Sports Illustrated in the same week, Carew received standing ovations nearly every at-bat, a memory that edifies him even now. “I’ll never forget that love,” says Carew, whose friends hope he’ll throw out a ceremonial first pitch next spring, and be buoyed by a ballpark ovation yet again. For Rod Carew knows better than anybody: There are many ways to fill a human heart.